SCHAUMBURG, Ill. (WLS) -- Police in northwest suburban Schaumburg are searching for several robbers who violently attacked a gas station clerk. 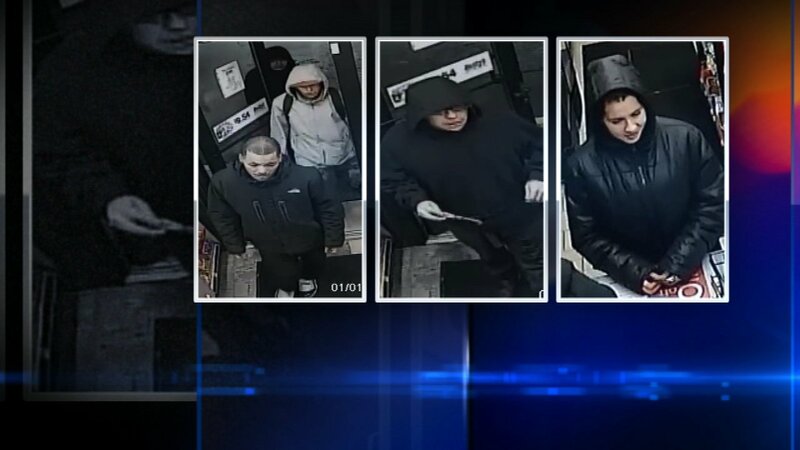 Surveillance photos show three men and a woman walked into the Mobil near Plum Grove and Schaumburg roads around 3:55 a.m. on New Year's Day. While the woman was buying something, the men attacked the clerk from behind and slammed him to the ground, stealing his cell phone and cash from the register. Elk Grove Village police said a similar incident happened in their town earlier that morning. They are working with Schaumburg police on this investigation. Anyone who recognizes the suspects or has information pertinent to the investigation should call the Schaumburg Police Investigations Bureau at 847-882-3586 or 311 if the caller is in Schaumburg.